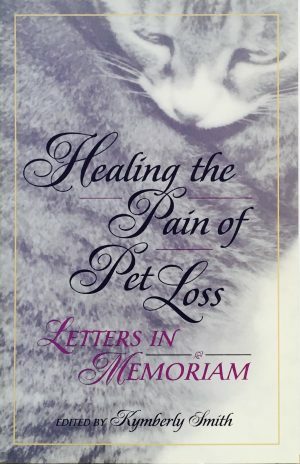 This special book is a collection of letters that were sent to author Kymberly Smith in response to her nationwide request in two magazines (Dog Fancy and I Love Cats) asking readers if they would be willing to share their own stories of losing a companion animal. She hoped that, perhaps, in their responses, she could find community, support, and learn something that would help her deal with the painful loss of her own cat. Smith's instinct was right on target. The hundreds of letters she received offered her the kind of advice, understanding and support that only people who have been there themselves can give. 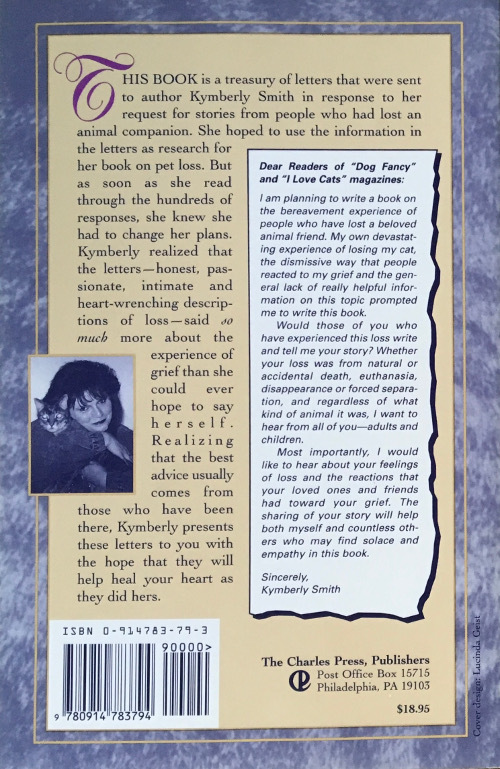 In fact, these letters played such an important role in Kym's own healing process that she wanted to share them with other people who are suffering, or who have suffered, the loss of a beloved animal friend. Offering a wide variety of grief experiences following the loss of different kinds of animals (including horses, cats, dogs, a ferret, a rabbit), this book takes an intimate and compassionate look at the way we react to the loss of our animal friends. While there is no magic cure for getting over immense loss, one very effective method that has helped millions of people is talking and listening to others who have experienced a similar incident — the people-helping-people dynamic known as self-help. In this sense, Healing the Pain of Pet Loss is a self-help group in a book, presenting the opportunity for same helping interaction between people who have a common struggle. By reading other peoples' stories of loss, readers can learn how others felt and reacted, how they overcame their grief and coped or, as in some cases, how they were unable to. With the companionship of the letter writers, readers will see they are not alone in their grief experiences. Because issues of death and dying invariably raise questions about what occurs after life has ended, a special section has been included that discusses the ways in which different religions view animals here on earth and in the afterlife. There is also a helpful annotated listing of the best online resources for people grieving over the loss of an animal friend, as well as an annotated bibliography of helpful books, a listing of telephone hotline numbers and places to contact for advice and assistance. This book is also an important resource for those who have experienced the loss of a pet such as veterinarians, vet staff and veterinary school students, teachers, psychologists, social workers and counselors. "This book meets its goal of telling true, unique and meaningful stories, and validating the human-animal bond, although it may be a most difficult read for its intended audience. I recommend it highly as extremely valuable reading." “Veterinarians and staff will recognize many of their clients here, expressing feelings they may not have been able to in a clinical setting. Included in the letters are references to veterinary experiences as people sought care for their pets. Veterinary professionals will gain insight into the depth and importance of the human-animal bond, along with the importance of connecting with their clients in this hard time. They will also be able to identify many of today's practice management challenges: state-of-the-art medical care, client service, problems with difficult clients and the need for sensitive client communications, all seen from the client's perspective. Several of the stories are tributes to the veterinarians who were especially compassionate and who provided much-needed help with decision-making. Whether we personally agree or disagree with some of the feelings, decisions and interpretations expressed, the authors offer valuable perspective and insight for our profession as we strive to understand our clients as well as the medical needs of our patients. In a gentle format such as this compilation of poignant letters, we may come to better understand our clients and the role of the human-animal bond in building our practices."